First off, the Tamir Rice shooting is a tragedy, and I sincerely pray for healing and reconciliation for all who were affected by it. This post is not about the shooting itself, or whether it was justified. I am not in a position to second guess the grand jury which found there was insufficient evidence to indict the officers, or the two outside investigations which found the officers acted reasonably. You can find opinions on that elsewhere. I wish to focus on one very specific thing I actually know a little bit about: the airsoft gun. The above image is of three real pistols I own and one airsoft pistol I also own. Can you identify the airsoft pistol? You have two seconds. Calling these things toys is misleading at best. They look and feel like the real thing. So much so that the reason I own one is because I wanted it for training. 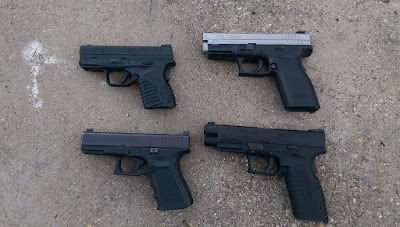 In the image of the four pistols the bottom right pistol is my XDM airsoft gun. It weighs and functions the same as a real XDM, which makes it useful for training. Airsoft pistols of this type typically run off of compressed gas and can propel the plastic bbs up to 500 feet per second. They are not a toys, they can cause serious injury if eye and ear protection are not warn. Personally I would never let a twelve year old play with one unsupervised. Let alone remove the orange safety tip and point it at people! Less you think I am blaming the victim my point is only this: that these things should not be treated as toys. Calling them toys obscures the fact that they are indistinguishable from a real gun. It also hides that they are, in and of themselves, dangerous and capable of bodily harm when not used properly. They are not toys. They should be respected. They should be used only in appropriate settings and with the proper safety gear. If you own one of these, I hope you consider this carefully.